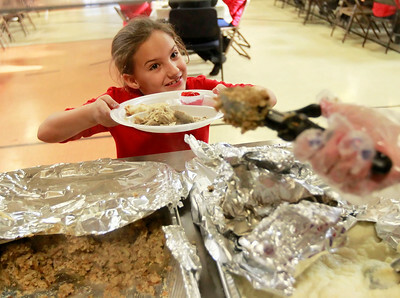 Candace H. Johnson-For Shaw Media Third-grader Grace Papuga, 8, gets some stuffing to eat with her turkey during the Thanksgiving Feast at St. Joseph Catholic School in Round Lake. 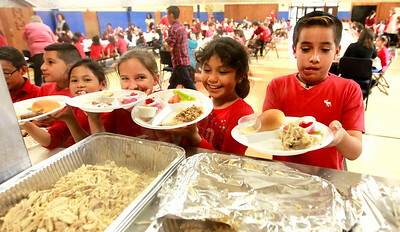 Candace H. Johnson-For Shaw Media Dylan Moncivals, Elyanna Torres and Grace Papuga, Nayeli Salgado and Ramses Rodriguez, all third graders, fill their plates with second helpings during the Thanksgiving Feast at St. Joseph Catholic School in Round Lake. 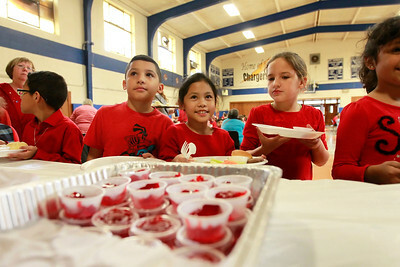 Candace H. Johnson-For Shaw Media Dylan Moncivals, Elyanna Torres and Grace Papuga, all third graders, wait on line to be served during the Thanksgiving Feast at St. Joseph Catholic School in Round Lake. Candace H. Johnson-For Shaw Media Mrs. Susan Smolen-Meyer sits with her second grade class during the Thanksgiving Feast at St. Joseph Catholic School in Round Lake. 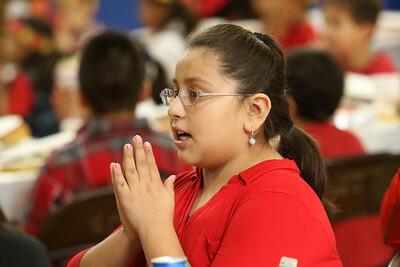 Candace H. Johnson-For Shaw Media Diana Garcia, of Round Lake Beach sits with her daughter, Cynthia, 11, a sixth grader, as they eat their meal during the Thanksgiving Feast at St. Joseph Catholic School in Round Lake. 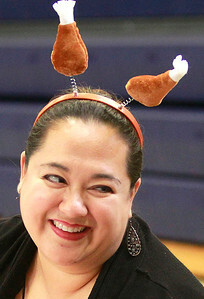 Candace H. Johnson-For Shaw Media Parent volunteers feed third grade students during the Thanksgiving Feast at St. Joseph Catholic School in Round Lake. 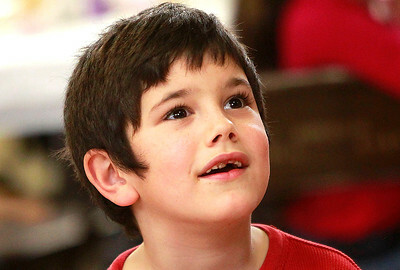 Candace H. Johnson-For Shaw Media Second grader Lucas Gomezdelatorre, 7, sings the song, "Start A Fire," during the Thanksgiving Feast at St. Joseph Catholic School in Round Lake. 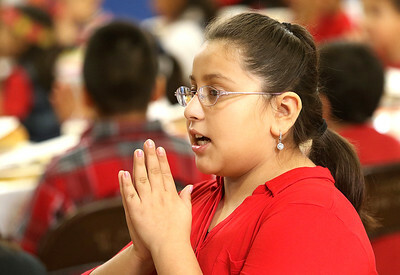 Candace H. Johnson-For Shaw Media Fourth grader, Nayary Huizar, 10, of Round Lake Beach prays before the Thanksgiving Feast at St. Joseph Catholic School in Round Lake. 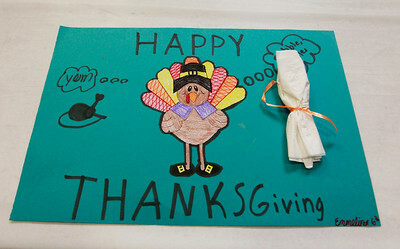 Candace H. Johnson-For Shaw Media A Happy Thanksgiving placemat made by sixth-grader, Emmelina Gomezdelatorre, 12, of Ingleside, decorates a table before the Thanksgiving Feast at St. Joseph Catholic School in Round Lake. 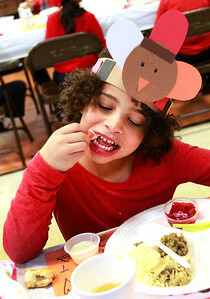 Candace H. Johnson-For Shaw Media Kindergartener Jocelyn Wright, 5, enjoys eating a carrot with her meal during the Thanksgiving Feast at St. Joseph Catholic School in Round Lake. 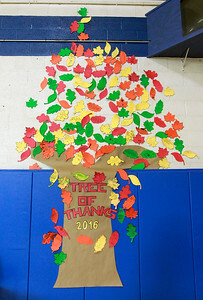 Candace H. Johnson The Tree of Thanks decorates a wall during the Thanksgiving Feast at the St. Joseph Catholic School in Round Lake. The leaves represent what the students from preschool through 8th grade are thankful for during the holidays. 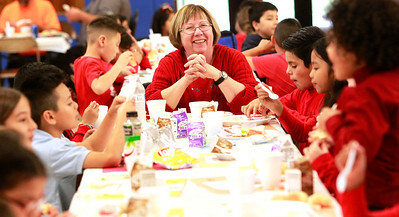 Mrs. Susan Smolen-Meyer sits with her second grade class during the Thanksgiving Feast at St. Joseph Catholic School in Round Lake.